In this post, the last of a 3-post series about Openstack Juno DVR, I go into the North-South SNAT scenario in details. Up until Juno, all L3 traffic was sent through the network node. In Juno, DVR was introduced to distribute the load from the network node onto the compute nodes. In my previous posts, I covered how DVR distributes the the East-West L3 traffic and the DNAT North-South. In this post I finish covering the North-South traffic with the Shared IP (SNAT). The SNAT North-South shared public gateway functionality was not distributed by DVR. It remains centralized on the Network Node, as you can see in the diagram below. In order to configure the SNAT namespaces on the Network node, the SNAT-DVR L3 agent is deployed. 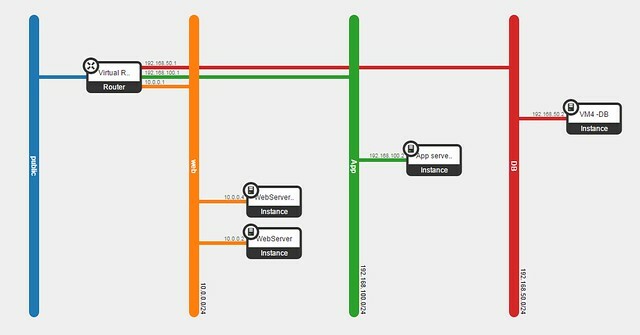 An additional private address is assigned in the SNAT namespace for each of the DVR connected subnets, thus providing the centralized SNAT functionality. 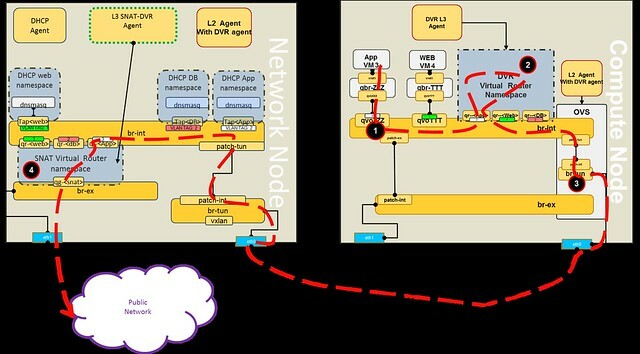 Lets follow a communication flow from VM3 in the App network to the public network. In my next post I will summarize the DVR solution in Openstack Juno. The configuration files I used to set-up the Openstack Neutron into DVR mode can be found here. In this post, the 2nd of a 3-post series about DVR, I go into the North-South DNAT scenario in details. In my previous post, I covered how DVR distributes the the East-West L3 traffic. In this post I am going to begin covering the North-South traffic starting with Floating IP (DNAT). In order to support Juno's DVR local handling of floating IP DNAT traffic in the compute nodes, we now require an additional physical port that connects to the external network, on each compute node. The Floating IP functionality enable direct access from the public network (e.g. Internet) to a VM. Let's follow the example below, where we will assign a floating IP to the web servers. Now, lets take a closer look at VM4 (one of the web servers). In the diagram below, the red dashed line shows the outbound network traffic flow from VM4 to the public network. The originating VM sends a packet via default gateway and the integration bridge forwards the traffic to the local DVR gateway port (qr-<portid>). 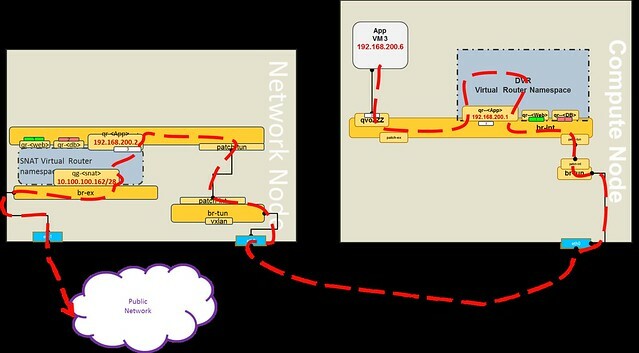 As you can see in the diagram, routing consumes an additional IP from the public range per compute node (e.g. 10.100.100.164). The reverse flow will go in the same route, the fg-<portid> act as a proxy ARP for the DVR namespace. In the next post, I will go into the North-South scenario using Shared IP (SNAT). Please feel free to leave comments, questions and corrections.